Sydney Shop Girl: Bananas. A Japanese Stir Fry. Monochrome. The Georges of the world can always be counted on for some light relief in the headlines. Just as Prince George left our shores for the long flight home comes news that the other George C is now engaged. Congratulations, George and Amal. Meanwhile at my desk, I posted my banana #weareallmonkeys photo on Instagram yesterday. Intrigued? Well, allow me to explain and in doing so demonstrate just about all my knowledge of international soccer. This is how Brazilian international and Barcelona full back Daniel Alves responded when a 'fan' attempted to racially abuse him by throwing a banana on the pitch during a game at Villareal. The nonchalant brilliance! What was even more inspiring was the way sporting stars and celebrities then took up the cause by posting photos of themselves eating bananas with the hashtags #weareallmonkeys and #saynotoracisim. Image from soccer player Neymar's Instagram. He and his son are holding bananas in a show of support for fellow player Alves. Amid all that is cruel and unjust in the world, 'little' things like this going viral on worldwide social media help remind me that while racism will always be a form of prejudice simmering in the background of society, there will also always be people willing to take a stand against it. They don't always have to be dramatic statements either. Often seemingly trivial actions are enough to create significant impact and hopefully changes in mindsets. Donald Sterling, an NBA team owner was handled by the game's Commissioner over racist comments he made about African American fans being present at NBA games. Sterling has been barred from the NBA for life and forced to pay a fine of $2.5 million dollars, the maximum penalty the NBA can enforce for his comments. There is significant pressure also for him to be forced to sell the team that he owns. Professional sport often gets a very bad rap in the media for the highly publicized dramas in the personal lives of its athletes. However the way the sporting world has reacted to the above incidents plus a current Australian campaign that addresses homophobia in sport have done a great deal to demonstrate the willingness these agencies have to try and change prejudices that were previously perceived as endemic to sporting culture. In more lightheaded sporting news ('sporting' because it took place at an indoor swimming pool that has been used as an Olympic training facility), I can report that 100% of the ladies swimming at my local at the weekend swear by Vaseline's Spray Moisturiser - Dry Skin Repair after doing their laps. The change room was buzzing with that distinctive noise these sprays make. The product is so easy to use, rubs in quickly and really does last all day. It also has a very pleasant fragrance. I also have the results of groundbreaking research from the SSG Manor Test Kitchen. 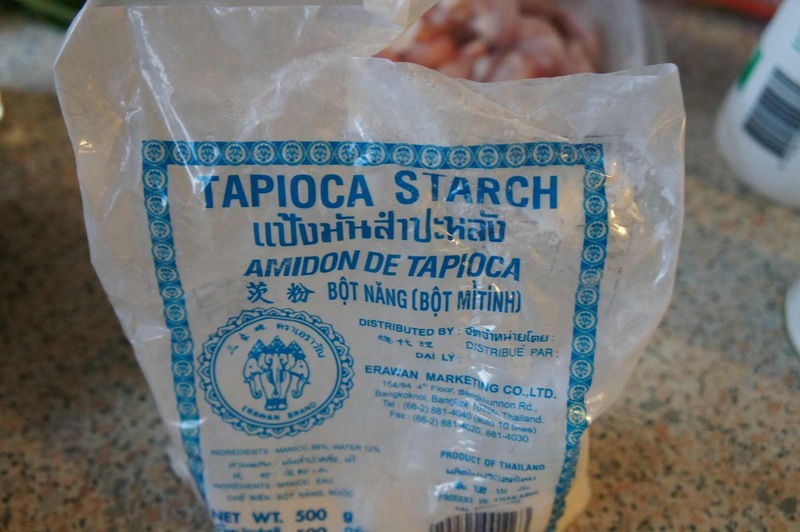 Whilst the internet may say that tapioca flour is a good substitute for cornflour, I don't think they were talking about stir fries. 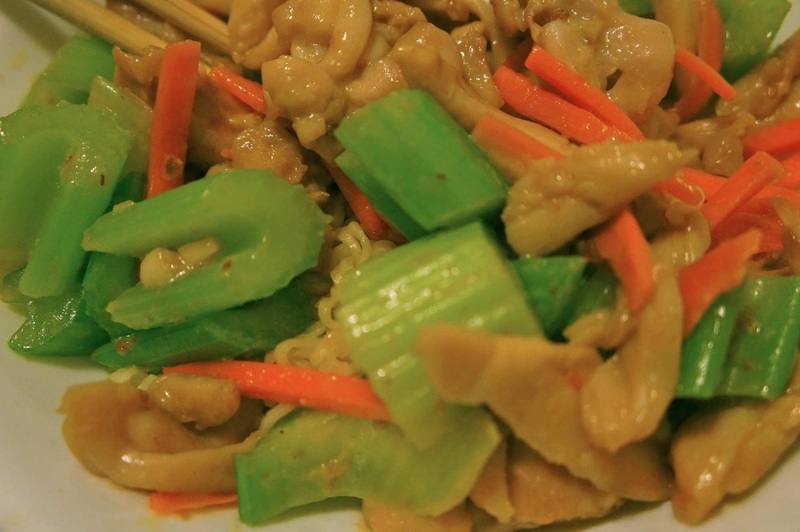 I made this Japanese Chicken and Celery Stir Fry on the weekend and coated my chicken pieces in tapioca flour. Which basically saw the whole base of my wok seize up in a golden crust of flour in about 2 seconds rendering it impossible for me to cook the chicken properly. I got there in the end after changing pans but it was a bit frustrating at the time. I'm off the get cornflour tonight. The stir fry itself is a keeper recipe for me. 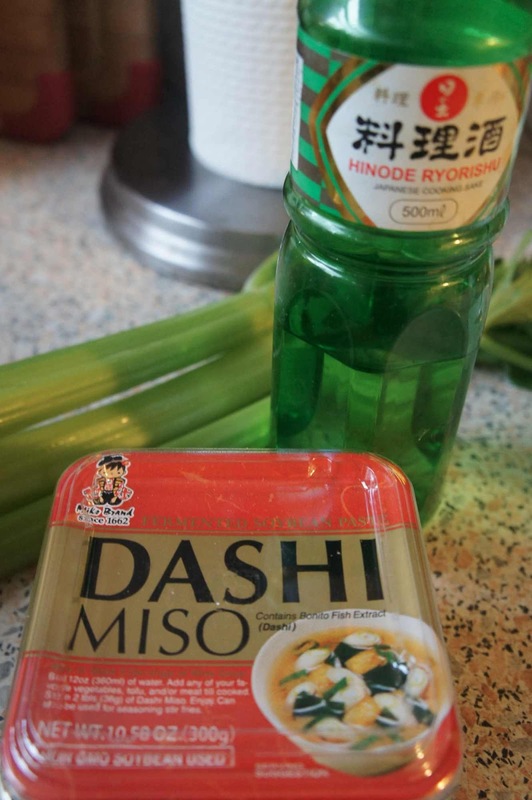 I had no idea dashi could be used in stir fries. The recipe is very quick to put together and the bit of chilli added to the sauce wasn't overpowering. It keeps well too. 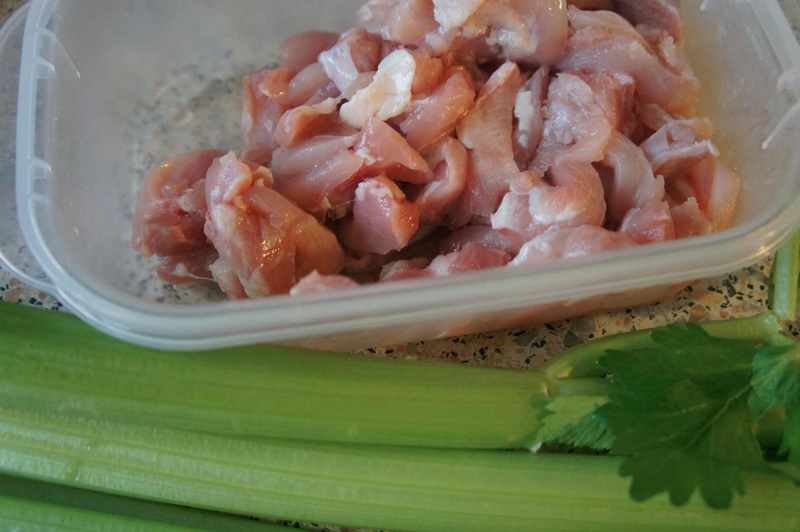 Possibly because the celery holds its crunch well through the stir frying process. I added some carrots for a bit of colour. Necklace - Red Phoenix Emporium, sweater - Mix Apparel, slim fit cuffed pants - Next Direct. 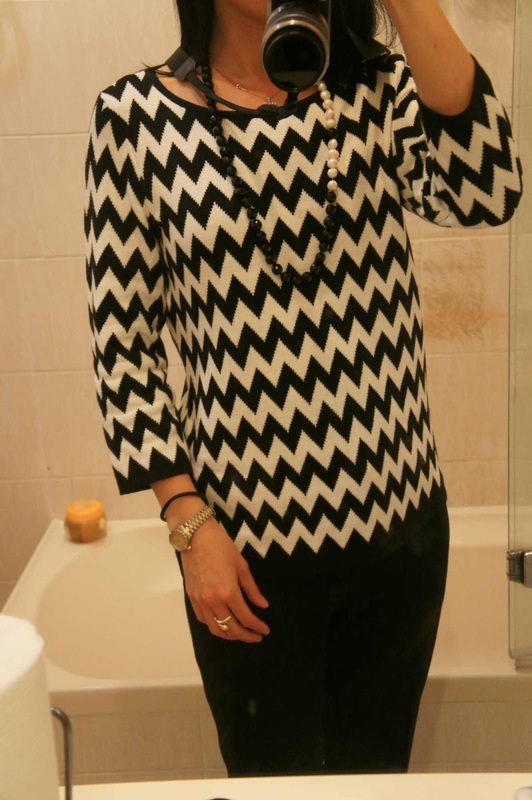 With the cooler weather and darker skies, monochrome has officially re-entered my wardrobe. This sweater from Mix is pretty toasty. I wish they also made a dress in this knit. Mix's opaque tights are officially The Business. They are a 'soft' matte black that hold their shape, are super soft and haven't laddered on me. Despite me often pulling them on in the half darkness as I try not to fall onto the furniture around me. Necklace - Red Phoenix Emporium, dress - Witchery. And here we are today in a Witchery stretch dress circa 2012 with a necklace from RPE's 2014 #eastergram sample sale. Have a lovely day and stay dry! Hadn't seen that video. Am sharing it! It's good to see Sport's big men taking a stand against injustice - the people who are likely to make a casual racist/sexist/homophobic remark are likely to take notice. Somewhat harder to deal with are the sociopaths who resort to physical violence and intimidation - we are starting to go from suggesting the victim change their behaviour to speaking out against the perpetrator and demanding full punishment. Have just signed up to the Mix emails. Noticed someone had commented on one of the pieces asking Coles to provide info on their manufacturing, I do hope it's above board because I feel I'll be trekking to the 'burbs to have a look in store and stock up. The kids' garb is pretty amazing too. That is a good point. I hope their manufacturing processes are ethical. Ashamed to admit I often act on the price to me in dollars before thinking about the human cost to the person who made what I just bought. A lot of wins here. George to marry a smart professional woman, the world putting down racism, good tights. I'm going to say it was a good day and applaud from California. I know. A good day, indeed!